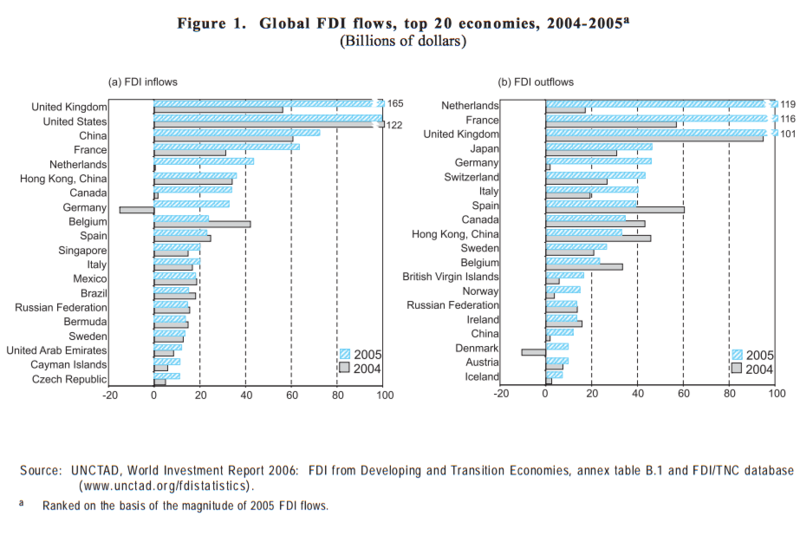 Inflows of foreign direct investment (FDI) were substantial in 2005. They rose by 29% – to reach $916 billion – having already increased by 27% in 2004. Inward FDI grew in all the main subregions, in some to unprecedented levels, and in 126 out of the 200 economies covered by UNCTAD. Nevertheless, world inflows remained far below the 2000 peak of $1.4 trillion. Similar to trends in the late 1990s, the recent upsurge in FDI reflects a greater level of cross-border mergers and acquisitions (M&As), especially among developed countries. It also reflects higher growth rates in some developed countries as well as strong economic performance in many developing and transition economies. Inflows to developed countries in 2005 amounted to $542 billion, an increase of 37% over 2004 (table 1), while to developing countries they rose to the highest level ever recorded – $334 billion. In percentage terms, the share of developed countries increased somewhat, to 59% of global inward FDI. The share of developing countries was 36% and that of South-East Europe and the Commonwealth of Independent States (CIS) was about 4%. The United Kingdom saw its inward FDI surge by $108 billion to reach a total of $165 billion, making it the largest recipient in 2005. Despite a decline in the level of inward FDI, the United States was the second largest recipient. Among developing economies, the list of the largest recipients compared with previous years remained stable, with China and Hong Kong (China) at the top, followed by Singapore, Mexico and Brazil. Regionally, the 25- member European Union (EU) was the favourite destination, with inflows of $422 billion, or almost half of the world total. South, East and South-East Asia received $165 billion, or about a fifth of that total, with the East Asian subregion accounting for about three quarters of the regional share. North America came next with $133 billion, and South and Central America followed with $65 billion. West Asia experienced the highest inward FDI growth rate, of 85%, amounting to $34 billion. Africa received $31 billion, the largest ever FDI inflow to that region. Global FDI outflows amounted to $779 billion (a different amount from that estimated for FDI inflows due to differences in data reporting and collecting methods of countries). Developed countries remain the leading sources of such outflows. 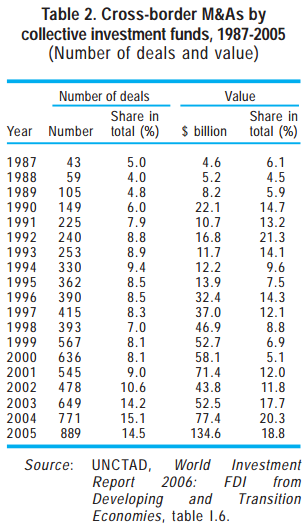 In 2005, the Netherlands reported outflows of $119 billion, followed by France and the United Kingdom. However, there were significant increases in outward investment by developing economies, led by Hong Kong (China) with $33 billion (figure 1). Indeed, the role of developing and transition economies as sources of FDI is increasing. Negligible or small until the mid-1980s, outflows from these economies totalled $133 billion last year, corresponding to some 17% of the world total. The implications of this trend are explored in detail in Part Two of this Report. Cross-border M&As, especially those involving companies in developed countries, have spurred the recent increases in FDI. The value of cross-border M&As rose by 88% over 2004, to $716 billion, and the number of deals rose by 20%, to 6,134. These levels are close to those achieved in the first year of the cross-border M&A boom of 1999-2001. The recent surge in M&A activity includes several major transactions, partly fuelled by the recovery of stock markets in 2005. There were 141 mega deals valued at more than $1 billion – close to the peak of 2000, when 175 such deals were observed. The value of mega deals was $454 billion in 2005 – more than twice the 2004 level and accounting for 63% of the total value of global crossborder M&As. A new feature of the recent M&A boom is increasing investment by collective investment funds, mainly private equity and related funds. A number of factors, including historically low interest rates and increasing financial integration, have led private equity firms to undertake direct investments abroad, which are estimated to have reached $135 billion in 2005 and accounted for 19% of total cross-border M&As (table 2). Unlike other kinds of FDI, private equity firms tend not to undertake long-term investment, and exit their positions with a time horizon of 5 to 10 years (or an average of 5-6 years), long enough not to be regarded as typical portfolio investors. Thus host countries, and developing ones in particular, need to be aware of this difference in time horizon. At the same time, foreign ownership can bring market access and new technologies, and private equity investment can help host-country enterprises at a critical juncture to move to a new phase of development. Services gained the most from the surge of FDI, particularly finance, telecommunications and real estate. (Since data on the sectoral distribution of FDI are limited, these observations are extrapolated from data relating to cross-border M&As, which accounted for a significant share of inflows.) The predominance of services in cross-border investments is not new. What is new is the further and sharp decline in the share of manufacturing (four percentage points lower in crossborder M&A sales over the preceding year) and the steep rise of FDI into the primary sector (with a sixfold increase in cross-border M&A sales), primarily the petroleum industry (figure 2). There has been a significant increase in developing-country firms in the universe of transnational corporations. 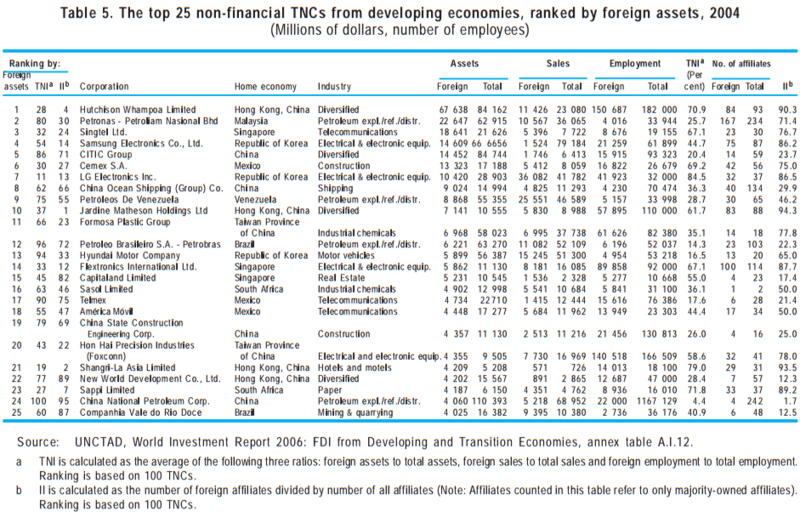 Transnational corporations (TNCs), most of them privately owned, undertake FDI. However, in some home countries (notably in the developing world) and in some industries (especially those related to natural resources) a number of major State-owned enterprises are also increasingly expanding abroad. According to estimates by UNCTAD, the universe of TNCs now spans some 77,000 parent companies with over 770,000 foreign affiliates. In 2005, these foreign affiliates generated an estimated $4.5 trillion in value added, employed some 62 million workers and exported goods and services valued at more than $4 trillion (table 3). 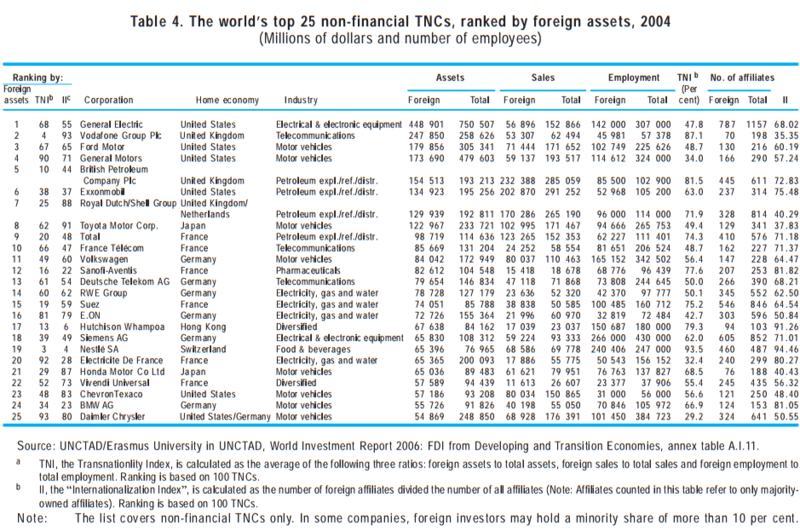 The TNC universe continues to be dominated by firms from the Triad – the EU, Japan and the United States – home to 85 of the world’s top 100 TNCs in 2004 (table 4 for the top 25 TNCs). Five countries (France, Germany, Japan, the United Kingdom and the United States) accounted for 73 of the top 100 firms, while 53 were from the EU. Heading the list of the global top 100 non-financial TNCs are General Electric, Vodafone and Ford, which together account for nearly 19% of the total assets of these 100 companies. The automobile industry dominates the list, followed by pharmaceuticals and telecommunications. However, firms from other countries are advancing internationally. Total sales of TNCs from developing countries reached an estimated $1.9 trillion in 2005 and they employed some 6 million workers. In 2004, there were five companies from developing economies in the list of the top 100 TNCs, all with headquarters in Asia, three of them State-owned. These five companies – Hutchison Whampoa (Hong Kong, China), Petronas (Malaysia), Singtel (Singapore) Samsung Electronics (the Republic of Korea) and CITIC Group (China) – topped the list of the largest 100 TNCs from developing countries (table 5 for the top 25 of these TNCs). (Since 1995, the World Investment Report has published a list of the top 50 TNCs, but in this Report the list has been expanded to cover 100 TNCs.) In 2004, 40 of the firms were from Hong Kong (China) and Taiwan Province of China, 14 from Singapore and 10 from China. Altogether, 77 of the top 100 TNCs had their headquarters in Asia; the remaining were equally distributed between Africa and Latin America. Liberalization continues, but some protectionist tendencies are also emerging. In terms of regulatory trends relating to investment, the pattern observed in previous years has persisted: the bulk of regulatory changes have facilitated FDI. They have involved simplified procedures, enhanced incentives, reduced taxes and greater openness to foreign investors. However, there have also been notable moves in the opposite direction (table 6). In both the EU and the United States, growing concerns have arisen over proposed foreign acquisitions. In early 2006, the acquisition by DP World (United Arab Emirates) of P&O (United Kingdom), a shipping and port management firm, along with that firm’s management of some ports in the United States, led to United States protests on the grounds of security. Similarly, in Europe concerns were voiced over a bid by Mittal Steel to acquire Arcelor, and broader European opposition to the EU’s own directive relating to the liberalization of services. Some notable regulatory steps were also taken to protect economies from foreign competition or to increase State influence in certain industries. The restrictive moves were mainly related to FDI in strategic areas such as petroleum and infrastructure. For example, the Latin American oil and gas industry became the focus of attention, particularly following the Bolivian Government’s decision to nationalize that industry in May 2006. In Africa, FDI inflows shot up from $17 billion in 2004 to an unprecedented $31 billion in 2005. Nonetheless, the region’s share in global FDI continued to be low, at just over 3%. South Africa was the leading recipient, with about 21% ($6.4 billion) of the region’s total inflows, mainly as a result of the acquisition of ABSA (South Africa) by Barclays Bank (United Kingdom). Egypt was the second largest recipient, followed by Nigeria. As in the past, with a few exceptions such as Sudan, most of the region’s 34 least developed countries (LDCs) attracted very little FDI. The leading source countries remained the United States and the United Kingdom, along with France and Germany further behind. Most of the FDI was in the form of greenfield investments. FDI flows to Africa in 2005 went mainly into natural resources, especially oil, although services (e.g. banking) also figured prominently. High commodity prices and strong demand for petroleum led to an increase in exploration activities in a number of African countries, including Algeria, Egypt, Equatorial Guinea, the Libyan Arab Jamahiriya, Mauritania, Nigeria and Sudan. TNCs from the United States and the EU continued to dominate the industry, but a number of developing-country TNCs, such as CNOOC from China, Petronas from Malaysia and ONGC Videsh from India, are increasingly expanding into Africa. Total FDI into six African oil-producing countries – Algeria, Chad, Egypt, Equatorial Guinea, Nigeria and Sudan – amounted to $15 billion, representing about 48% of inflows into the region in 2005. Although outward FDI from Africa declined in 2005, several African TNCs deepened their internationalization, including through cross-border M&As. For example, Orascom, acquired Wind Telecommunicazioni of Italy through Weather Investments of Egypt. Most of the FDI from South Africa, the leading investor in Africa, went to developing countries in 2005. Manufacturing attracted less FDI than natural resources and services. However, some sector-specific developments are worth highlighting. Automotive TNCs have set up export-oriented production facilities in South Africa, generating employment opportunities and export revenues. Conversely, fragmented markets, poor infrastructure and a lack of skilled workers, coupled with the ending in 2005 of the quotas established under the Multi-Fibre Arrangement (MFA), contributed to some divestment in the ready-made garments industry in countries like Lesotho. These divestments suggest that preferential market access (as provided by the United States’ African Growth and Opportunities Act and the EU’s Everything But Arms initiative) is not in itself sufficient to attract and retain manufacturing FDI in a globalizing environment. If African countries are to become internationally competitive, it is essential that they strengthen the necessary linkages between their export sectors and the rest of the economy by building and fostering domestic capabilities in areas such as physical infrastructure, production capacity and institutions supportive of private investment. There have been positive developments in terms of regulatory regimes, and many African countries have signed new bilateral agreements related to investment and taxation. However, attracting quality FDI – the kind that would significantly increase employment, enhance skills and boost the competitiveness of local enterprises – remains a challenge. Africa’s industrial progress requires competitive production capacity, in addition to better market access. Over half of the inflows to the region came from developing home economies, mostly within the region. The figures for inward stock show significant growth in the share of these sources over the past decade, from about 44% in 1995 to about 65% in 2004, with a corresponding decline in the share of developed-country sources. Manufacturing FDI has been increasingly attracted to South, East and South-East Asia, although specific locations have changed as countries have moved up the value chain. The sector continues to attract large inflows, especially in the automotive, electronics, steel and petrochemical industries. Viet Nam has become a new location of choice, attracting new investment by companies such as Intel, which is investing $300 million in the first semiconductor assembly plant in that country. In China, investment in manufacturing is moving into more advanced technologies; for example, Airbus plans to set up an assembly operation for its A320 aircraft. There is, however, a shift towards services in the region, in particular banking, telecommunications and real estate. Countries in South, East and South-East Asia continue to open up their economies to inward FDI. Significant steps in this direction were taken in 2005, particularly in services. For example, India is now allowing singlebrand retail FDI as well as investment in construction, and China has lifted geographic restrictions on operations of foreign banks and travel agencies. A few measures were also introduced to address concerns over cross-border M&As in countries such as the Republic of Korea. South, East and South-East Asia is also an emerging source of FDI (among developing countries), with outflows of $68 billion in 2005. Although this implies a drop of 11% from 2004, Chinese outflows increased and seem set to rise further in the next few years. Many of the region’s countries have accumulated large foreign reserves, which may lead to more outward FDI. Among the main recent FDI deals involving companies from this region were Temasek’s (Singapore) purchase of an 11.5% stake in Standard Chartered (United Kingdom) in 2006, and CNPC’s (China) takeover of Petrokazakhstan in 2005. China and India have been energetically pursuing the acquisition of oil assets, and have even cooperated on some bids. … while West Asia received an unprecedented level of inflows. FDI inflows into the 14 economies of West Asia soared by 85%, the highest rate in the developing world in 2005, to reach a total increase of about $34 billion. High oil prices and consequently strong GDP growth were among the main factors that drove this increase. In addition, the regulatory regime was further liberalized, with an emphasis on privatization involving FDI notably in services: for instance, power and water in Bahrain, Jordan, Oman and the United Arab Emirates, transport in Jordan, and telecommunications in Jordan and Turkey. West Asia is becoming a significant outward direct investor. Traditionally, most of the region’s petrodollars have gone into bank deposits and portfolio purchases abroad, particularly in the United States. This is changing in both form and location. Unlike the previous periods of high oil revenues, the present phase is witnessing substantial outward FDI in services, in developing as well as developed countries. One motivation for this has been to forge stronger economic ties with the emerging Asian giants, China and India, but investment has also gone into Europe and Africa. Deals such as the above-mentioned acquisition of P&O by DP World, and the purchase of Celtel International (Netherlands) by Kuwait’s Mobile Telecommunications illustrate this trend. Notable cases of South-South FDI include the purchase of a 25% share by Saudi Aramco in a refinery in Fujian, China, and a possible Saudi equity partnership with India’s ONGC in a refinery in Andhra Pradesh, India. Latin America and the Caribbean saw inflows of $104 billion, representing a small rise over 2004. Excluding the offshore financial centres, inflows increased by 12%, to reach $67 billion in 2005. Economic growth and high commodity prices were contributory factors. The region registered exceptional GDP growth rates in 2004-2005, surpassing those of the world average for the first time in 25 years. Strong demand for commodities contributed to a noticeable improvement in the regional trade balance. A significant proportion of the FDI inflows consisted of reinvested earnings, reflecting a marked increase in corporate profits. Trends varied by country: while inflows decreased in Brazil (- 17%), Chile (-7%) and Mexico (-3%), they rose significantly in Uruguay (81%), more than trebled in Colombia, almost doubled in Venezuela, and increased by 65% and 61% in Ecuador and Peru respectively. Sectorally, the share of FDI in services in total FDI flows continued to decline, from 40% in 2004 to 35% in 2005 – a very low share compared with other regions. Some TNCs continued to withdraw from the region, in part due to disputes with host governments in areas such as public utilities (e.g. the withdrawal from Argentina of Suez and EDF (both French firms)). Manufacturing accounted for just over 40% of inflows, including a relatively large number of M&As, such as SABMiller’s takeover of breweries in Colombia and Peru, Grupo Techint’s (Argentina) purchase of the steel-maker Hylsamex (Mexico), and Camargo Correa’s (Brazil) acquisition of the cementmaker, Loma Negra (Argentina). Notwithstanding significant differences across countries, there appears to be a trend towards greater State intervention in the region, above all in the oil industry, and other natural resources. As a result of the large windfall earnings generated by the exploitation of natural resources and high commodity prices, several governments are introducing rules that are less favourable to FDI than those established in the 1990s, when commodity prices were at record lows. For instance, oil and gas resources have been nationalized in Bolivia; and the Government of Venezuela took control of 32 oilfields previously under private control, and created new State-owned companies in sectors such as sugar processing, retailing and communications. In addition, a broader shift in policy is under way in some countries, which aims at addressing income inequalities attributed to previous policy regimes. Regional cooperation in the area of investment experienced several setbacks in 2005. Negotiations on establishing a 34-country Free Trade Agreement of the Americas stalled owing to opposition by five countries (including Argentina and Brazil); the free-trade talks between Ecuador and the United States were suspended following a takeover by the Government of Ecuador of Occident Petroleum’s production infrastructure. FDI outflows from Latin America and the Caribbean increased by 19% to $33 billion in 2005, with TNCs from the region acquiring assets mainly in telecommunications and heavy industries. As a significant share of these investments is within Latin America and the Caribbean, it also contributes to FDI inflows into the region. FDI flows to South-East Europe and the CIS in 2005 remained at a relatively high level ($40 billion), increasing only slightly over the previous year. Inflows were fairly concentrated: three countries – the Russian Federation, Ukraine and Romania, in that order – accounted for close to three quarters of the total. FDI outflows from the region grew for a fourth consecutive year, reaching $15 billion, with the Russian Federation alone responsible for 87% of the total outflows. The countries of the region have different policy priorities related to inward and outward FDI, reflecting their varying economic structures and institutional environments. In naturalresource-based economies, such as the Russian Federation, Azerbaijan and Kazakhstan, most of the policy issues concern management of the windfall earnings from high international oil prices, and the definition – or redefinition – of the role of the State. FDI inflows into developed countries rose by 37% to $542 billion, or 59% of the world total. Of this, $422 billion went to the 25-member EU. The United Kingdom – the largest single recipient of global FDI – received $165 billion. The main contributory factor was the merger of Shell Transport and Trading (United Kingdom) with Royal Dutch Petroleum (the Netherlands), a deal valued at $74 billion. Other major FDI recipients, that registered significant increases in their FDI inflows included France ($64 billion), the Netherlands ($44 billion) and Canada ($34 billion). The 10 new EU members together attracted $34 billion, a rise of 19% over 2004 and another new record high. Inflows into the United States amounted to $99 billion, a significant decline from 2004. Although well over 90% of all inflows into developed countries originated from other developed countries, several notable investments by TNCs from developing countries also took place, including Lenovo’s (China) takeover of IBM’s personal computer division and the above-mentioned purchase of Italian Wind Telecomunicazioni by Orascom of Egypt through Weather Investments. FDI into developed countries increased in all three sectors: primary, manufacturing and services. In keeping with the global trend, investment in natural resources increased significantly. In manufacturing, some of the new EU members (especially the Czech Republic, Hungary, Poland and Slovakia) consolidated their positions as preferred locations for automotive production. Hyundai Motors, for instance, announced plans to set up new plants in the Czech Republic and in Slovakia. The new EU members are likely to maintain their comparative advantages (e.g. their average wage is 30% of the average wage in the older EU countries) for some time, and their automotive production is expected to double over the next five years, to 3.2 million vehicles. In 2005, there were intense political discussions on various aspects of FDI, and especially cross-border M&As, in developed countries. On the one hand, some countries, particularly the 10 new EU member States, continue to privatize, reduce corporate income taxes and provide new incentives to attract more FDI. On the other hand, various concerns have been raised in a number of countries following the increased M&A activity. National security concerns, for example, led to a blocking of the purchase of Unocal (United States) by CNOOC (China); the Governments of Spain and France tried to prevent the buyouts of Endesa and Suez, respectively, by companies from other EU countries, and steps were taken to protect national champions. Japan has postponed the approval of cross-border M&As through share swaps and adopted some restrictions in the retail industry for instance. 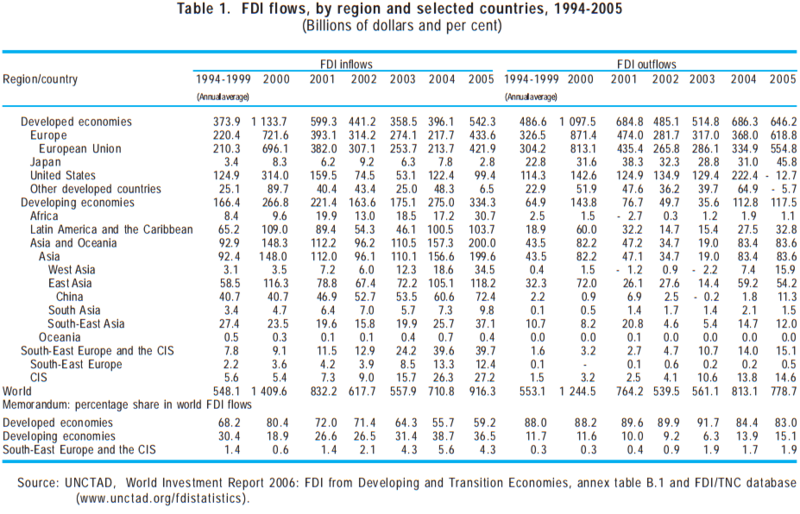 World FDI inflows are expected to increase further in 2006. This prospect is based on continued economic growth, increased corporate profits – with a consequent increase in stock prices that would boost the value of cross-border M&As – and policy liberalization. 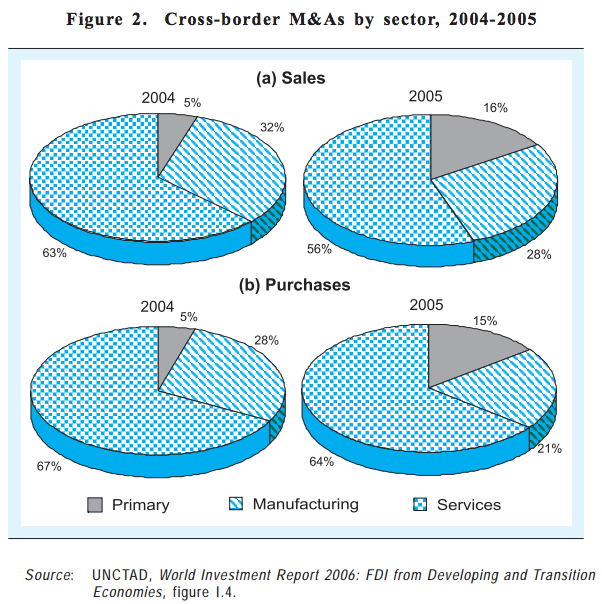 In the first half of 2006, cross-border M&As rose 39% compared to the same period in 2005. However, there are factors that may dampen further FDI growth. These include the continuing high oil prices, rising interest rates and increased inflationary pressures, which may restrain economic growth in most regions. Also, various economic imbalances in the global economy as well as geopolitical tensions in some parts of the world are adding to the uncertainty. Foreign direct investment in 2005 grew for the second consecutive year, and it was a worldwide phenomenon. It was spurred by cross-border M&As, with increasing deals also undertaken by collective investment funds. Most inflows went into services, but the sharpest rise in FDI was in natural resources. There has been a significant increase in developing-country firms in the universe of transnational corporations. Liberalization continues, but some protectionist tendencies are also emerging. 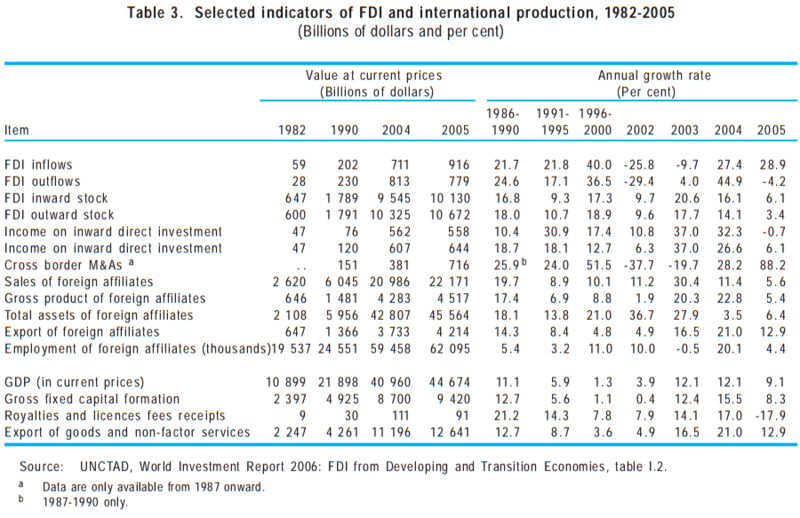 Africa attracted much higher levels of FDI. South, East and South-East Asia is still the main magnet for inflows into developing countries ... … while West Asia received an unprecedented level of inflows. Latin America and the Caribbean continued to receive substantial FDI. FDI flows to South-East Europe and the Commonwealth of Independent States remained relatively high... …while there was an upturn in FDI to developed countries. Overall, FDI should continue to grow in the short term.